We are proud to open the doors of eight new Innovation Labs in Europe. These labs enable manufacturers to experience the benefits of having a connected, automated and intelligent factory, optimized with the latest automation and robotics technologies, in addition to proof of concept testing for new environments. Omron engineers will work together with customers, sharing engineering skills and knowledge to master those new technologies. Each new Innovation Lab will include a range of innovative technologies including fixed and mobile robotics systems. The goal of these labs is to better prepare manufactures for today’s Smart Manufacturing opportunities and explore the use of advanced artificial intelligence (AI), the Internet of things (IoT) and robotics for their operation, especially those in the food & commodities, packaging and automotive industries as well as those involved with mechanical and plant engineering. The new Innovation Labs address the particular needs of an individual customer in local language. They provide concrete evidence that integrated robotics and automation can reduce costs, enhance quality, and increase productivity. The aim is to create a “proof of concept” for the customer, one that can be tangibly implemented in production. In effect the Innovation Labs bridge the gap between theory and practice. 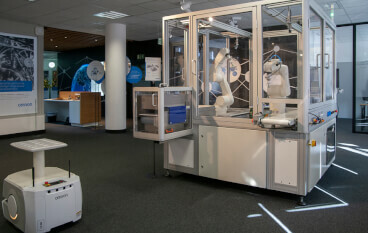 Each lab includes several robot cells with SCARA and six-axis robots, which are supported by a mobile robot to demonstrate intralogistics processes. Now the Innovation Labs will show individual customers how their own existing production set-ups can benefit from integrated robotics and automation. This means testing things out together, to see whether the solution actually works in a practical environment. We essentially provide a ‘proof of concept’ that enables customers to see for themselves how to implement integrated robotics and automation. With these new Innovation Labs we are enabling our customer to seize the advantages of Smart Manufacturing as part of our commitment to bringing innovation to manufacturing sites that are integrated" (control evolution), "intelligent" (development of intelligence by ICT), and "interactive" (new harmonization between people and machines). The first five Innovation Labs will be up and running by October 2018 and two more will be opened soon after. Locations include Stuttgart in Germany, Milan in Italy, Madrid in Spain, Milton Keynes in the UK, Tychy in Poland, Istanbul in Turkey, and Annecy in France. These seven new Innovation Labs join the Nordic Automation Center, located in Malmo, Sweden, which has been successfully providing a similar role since October 2017.